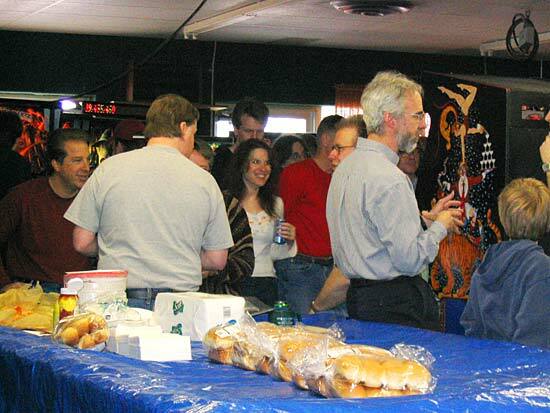 Back in April 2001, SS Billiards began the first of a series of goose-themed events with the Launch Those Geese party. It was so called after a suggestion by David Gersic for the possible meaning of Lloyd Olson's (owner of SS Billiards) moniker LTG. Bring Your Own Goose, Silence Of The Geese and Sherlock Goose all followed but in October of 2004, the geese flew south for the winter to make way for the first Pinball Circus event. Since then, they have become bi-annual taking place every April and October. 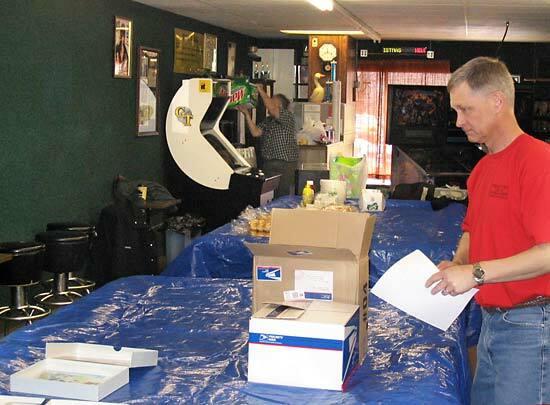 So Pinball News headed off to Hopkins, MN for the fourth Pinball Circus. After helping to set things up the previous day, we arrived at 10am the get everything ready for the midday start. Entry to the Circus cost $20, for which you got plenty of cold soda and hot dogs along with regular pizza deliveries throughout the day. If that wasn't enough sustenance, there were a couple of outlets selling more just along the block. The games were all set on free play and Lloyd's regular line-up was supplemented by five extra games brought in just for the party. Eric brought a Funhouse, Derek and Tina brought a Target Alpha and a Close Encounters Of The Third Kind, while Bryan brought a Cactus Canyon. Derek and Tina with their rare Close Encounters game. It's an EM game but has solid state sound. Those of you who visited Pinball Expo last year may have already made your acquaintances with Pinbo but he was kept busy and wasn't an easy fellow to meet. At the Pinball Circus, he was much more relaxed and accessible. Pinbo has a friend to play with. Pinbo is, of course, one of the main toys in the rare The Pinball Circus machine, made by Midway in the 1994 as a concept game. Designed by Python Anghelo, it sits in an upright cabinet like a video game and consists of a small main playfield with three mini-playfields at various height above. These mini-playfields are accessible by shooting the ball up a ramp from each level to the next. 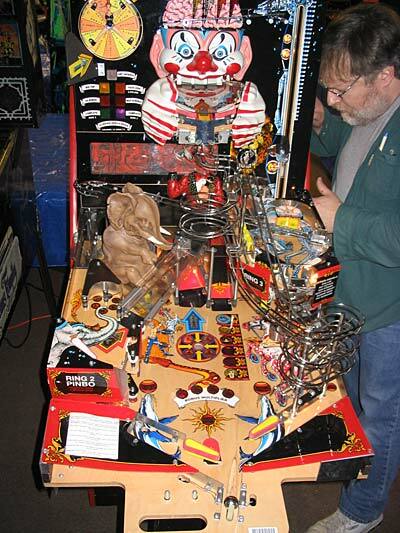 Pinbo helps take the ball from the first upper level - Ring 2 - to Ring 3 while a mechanical giraffe elevator takes it all the way up to the top of the game to a mini-playfield in front of the clown's mouth. Make a mistake at any level and the ball spirals back down to the main playfield for you to try again. Medieval Madness, Bram Stoker's Dracula, Lord Of The Rings, Monster Bash, NASCAR, The Addams Family, Funhouse, Cactus Canyon, Target Alpha, Close Encounters Of The Third Kind, Corvette, Attack From Mars, South Park, Twilight Zone, Demolition Man, Indianapolis 500, Tales From The Crypt, Banzai Run, Safecracker, Eight Ball Deluxe Limited Edition, No Good Gofers and Doodle Bug. 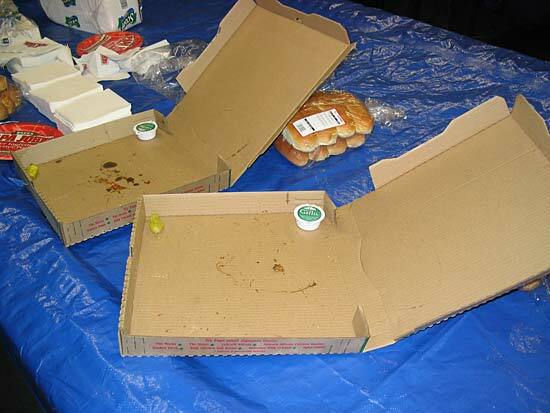 If all that playing made you hungry, at regular intervals Lloyd would call out "PIZZA!" to announce the arrival of the next batch from Papa John's. Despite putting my camera on its fastest shutter speed, this was as close as I got to photographing the mystical disappearing pizza. Some say it was pepperoni, some that it was a mysterious meat concoction while others say it was delivered by Bigfoot himself. Sadly, all that remains of this mystery is a green chili and a tub of garlic sauce. Believe It Or Not! But lest you think the Circus is all about free play, food and drink, there was a whole raft of other events taking place. For one, Pinball Renaissance's Todd "PinTed" Andersen hosted a seminar on using a logic probe to fault find electrical circuits. He has kindly made his seminar available to Pinball News readers and it can be found at the end of this report. 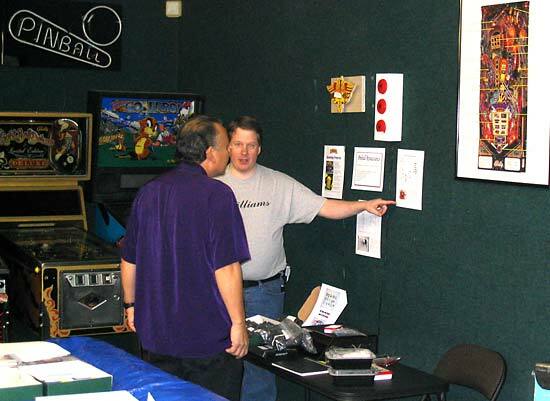 When not holding the seminar Todd also had a good selection of pinball goodies for sale including flyers, t-shirts, manuals and the LDR switches and infra-red testers featured in his earlier Pinball News articles. Todd talks with Steve Tsubota about his pinball LDR circuit. Bryan Kelly was also selling his Executive Pin Footies - crafted wood cups to hold the feet of your pinball. They are the perfect match for wooden floors and smarten up what is otherwise quite an ugly set of feet while providing protection to carpeted floors. or can be made to order in other woods. There was also a number of competitions taking place. Probably the strangest was the Goose Egg played on an Addams Family. The game was set to one ball per game, the inlane guides were removed and replaced with posts leaving a large gap for the ball to drain, and the standup target next to the centre ramp was wired as the slam tilt switch causing the loss of your score! Despite these handicaps, some excellent scores of over 30M were achieved with Boyd Epeneter winning the honours. 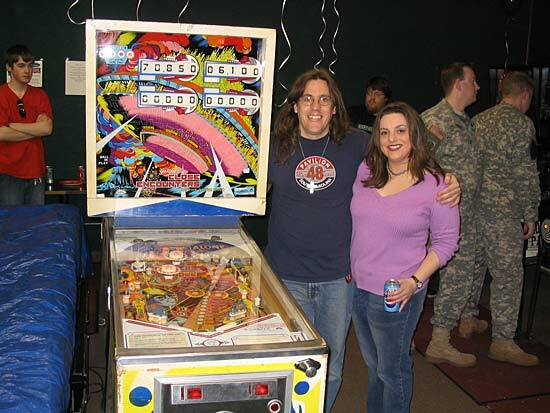 There was also a regular Saturday Night Pinball competition won by Tina Curtis along with a Last Man Standing tournament played out on the Doodle Bug which was won by TJA who managed to roll the machine and get an extra 53,700 points on top. 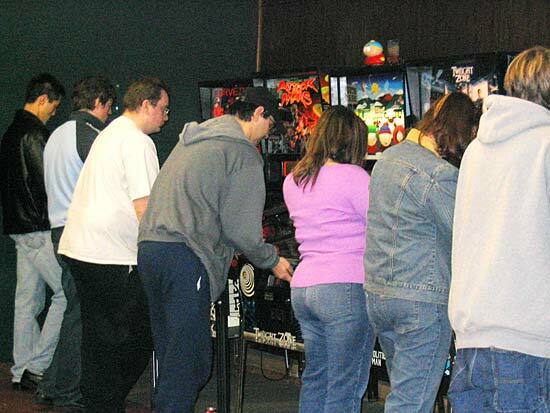 There were ToPS tournaments on NASCAR and Lord of the Rings and also a "Guess the Quarters" game run by Pinball Renaissance where the first person to correctly guess the number of quarters in a tin won them. WEB correctly guessed 36. 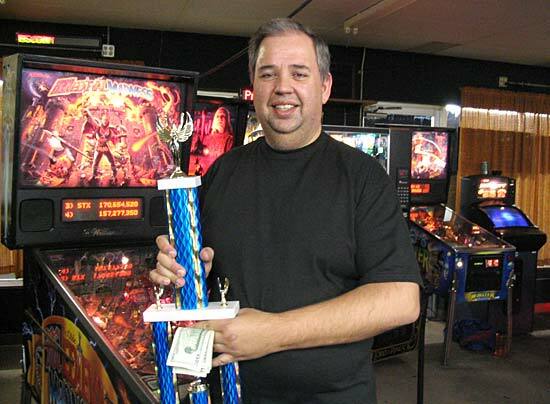 There was also a special Pinball Circus tournament with a trophy and a $200 prize for the winner. 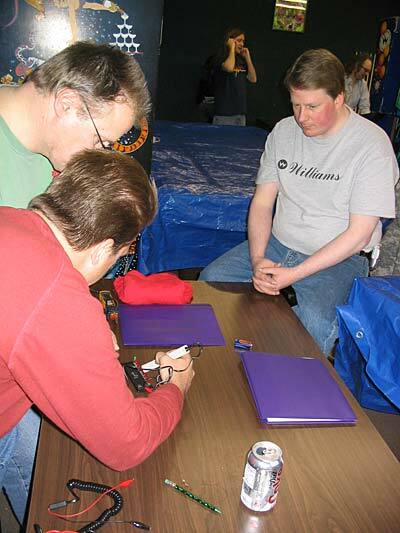 Players were randomly drawn against other and they played the best-of-three with a single game on three random machines. After several grueling rounds we were down to the final three who played out the final on Demolition Man, Corvette, Target Alpha, NASCAR and Medieval Madness. In a closely fought final, it all came down to the last ball on the final game but the winner was Pinball News Editor, Martin Ayub from London, UK. There were also regular door prize draws throughout the Circus with goodies ranging from mugs and t-shirts to translites and Pin Footies, infra-red testers and holographic scorecard lenticulars. Creature From the Black Lagoon lenticular light up apron card donated by Steve Tsubota. There were also a number of unclaimed prizes. Winners should contact SS Billiards to stake their claim. The Circus continued until midnight after which it was time to put everything back to something approaching normality ready for opening on Sunday. Pinbo had become tired and cranky, requiring a little TLC before the long trip back to Chicago but Todd put his troubleshooting skills to good use and soon the elephant was safely tucked-up for the night. What really makes Pinball Circus such a great event is the opportunity to hang out with a superb bunch of friendly, dedicated pinball fans. There was no ill-tempered behaviour and everyone seemed to be genuinely enjoying themselves. Despite the number of events and competitions, there was plenty of time to talk without feeling you're missing out on playing the games. The twelve hours just flew by and it was disappointing to find out it was all over so quickly. Lloyd puts a lot of effort and money into making Pinball Circus the success it is. He gets special t-shirts and mugs made, buys the engraved trophy and supplies the prize money for all the tournaments, gets the food and drink, while turning away the paying pool players for the day. Events like this are few and far between and deserve supporting. Those who were there know what a good time it was. If you didn't make it this time, don't miss out again. Logic probes have been used for decades to troubleshoot electronic circuits. 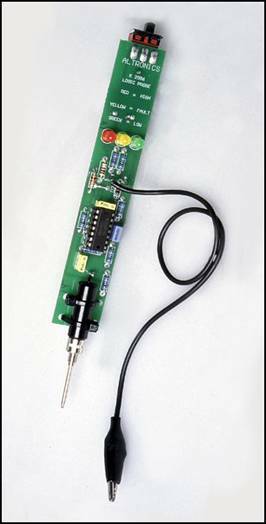 Logic probes are test instruments used to determine the voltage level of digital logic circuits, both TTL and CMOS. Over the years, logic probes have ranged in: prices, functionality, and features. They may be very simple or very complex. The picture of the simple logic probe, on the left, is courtesy of Altronics . The other picture of the complex probe is courtesy of NDSU . Though information on the subject if using a logic probe to troubleshoot pinball boards is available on the Internet, that information is usually board/system specific. This introductory seminar will use a general and common circuit, which is used in pinball machines, to teach you general use of a simple and inexpensive logic probe. The simple probe was chosen for several reasons. Besides being affordable and easy to purchase, the simple probe would also be easier to use. Though the simplicity of use has test limitations, it is the opinion of the author that more complex troubleshooting can best be done with an oscilloscope. Electronic troubleshooting with the use of an oscilloscope will not be covered in this seminar. Digital Logic or Boolean algebra will also not be covered in this seminar. But, at the end of this seminar you should be able to use a logic probe with proficiency and comfort. “Safety first” is not just an expression. Safety is the first and most important aspect of dealing with electricity; including electronic troubleshooting. The circuit used in this seminar and boards in your pinball machine(s) must be powered up for you to be able to perform electronic troubleshooting. If you do not feel comfortable testing a circuit that has voltages applied, do not attempt troubleshooting. Improper troubleshooting my damage the circuit under test. I recommend that, if especially you are a novice at electronics, and troubleshooting with a logic probe gives you more questions than answers, that you send your board in for repair. 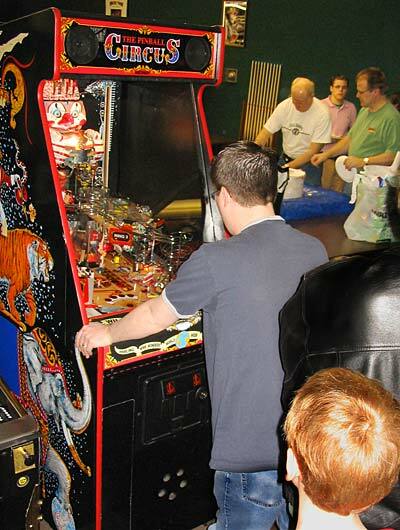 The subject of pinball board repair houses has been covered on the pinball newsgroup; rec.games.pinball – RGP. For safety's sake, you must first ensure that your pinball machine is plugged into a property grounded three-prong AC circuit. This type of circuit can be verified with a circuit tester. If the electrical circuit is not properly grounded, you must call a qualified electrician to correct this potentially lethal problem. If your pinball machine is not properly grounded you must correct this potentially lethal problem before you can troubleshoot any of its boards. If you cannot verify, or if necessary, correct the current going into your pinball machine - stop. The next step is for you to ensure that the proper voltages are getting to the circuit board(s) to be tested. The use of DMMs is preferred because they are a hand held piece of test equipment. 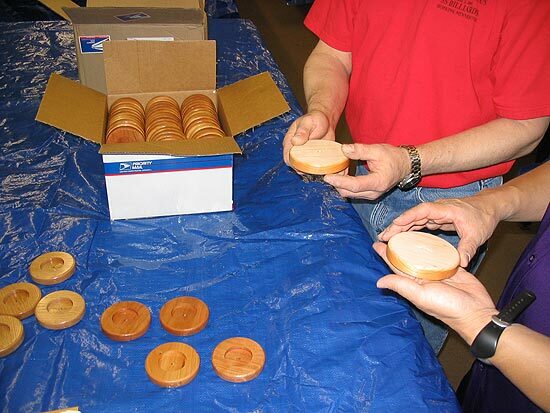 Many different manufacturers make many different types and styles of DMMs. So, the following instructions will try to be inclusive of many types of DMMs. For Safety's Sake: Always remember to keep your hands on the plastic, insulated part of your DMM lest leads (or probes) and away from the shinny metal points! Also, be sure to contact ONLY the one pin or leg of the component under test with the RED test lead tip while keeping your BLACK test lead tip on ground. Insert the plug of the RED test lead into the jack that is labeled: “RED”, and/or “+”, and/or “V”, and/or “Ohm”, and/or the Greek symbol (omega). Next insert the plug of the BLACK test lead into the jack that is labeled “BLACK” and/or “-”, and/or “Gnd”, and/or with the symbol (ground). Turn on and/or set your meter to read “VDC” or “- - -”. Preferably, leave your DMM in auto mode. If “Auto” is not available in your meter, set your DMM to measure the largest scale or largest reading. I.E. 1000 Volts – Not 10 Volts. Now, touch and hold the points or probe ends of your test leads together. If you did not get an intelligible reading, set your probes in a safe place, with the metal leads not shorting to each other or any other nearby circuit, and adjust your range down to the next smaller scale or reading. Repeat this step until you can verity the reading you were looking for above. Now, set and leave your test leads on the table. Your meter should read: “OL”, or “OOL”. Or your meter's display may simply “flash”. And/or your display my flash “OL”, or “OOL”. Set your DMM to the side but leave it set-up in this condition. In a previous seminar we learned that active electronic components “work” at specific voltage levels. Electronic circuits require certain voltages in order to operate. The first thing to do before automatically going to your logic probe; is to verify that the proper voltages are available on the circuit board(s). This seminar will utilize a test circuit instead of a board from a pinball machine. Use of the test circuit will teach you how to troubleshoot digital logic without fear of harming yourself or your circuit. The schematic of the test circuit is given near the end of this seminar. Use your DMM to verify that the test circuit is being powered by approximately +9 Vdc and that approximately +5 Vdc is going into the circuit. Finally, verify that the circuit is grounded by the battery's negative terminal. Note: In order to verify proper voltages, you may have to bring down the scale of your DMM. If so, bring down the scale one range at a time and repeat the steps below. Attach the battery to the clip and check your voltages. First touch the meal tip of the BLACK test lead to the tab of the voltage regulator in the circuit under test. While keeping the BLACK test lead in place, touch the meal tip of the RED test lead to the “VIN” test point of the CUT. Record your voltage reading __________ Vdc. Put the meal tip of the BLACK test lead back on the tab of the voltage regulator. While keeping the BLACK test lead in place, touch the meal tip of the RED test lead to the “VOUT” test point of the CUT. If you got approximately +9 Vdc for the VIN reading and +5 Vdc for the VOUT reading, you used the proper ground. If you got a –9 and –5 Vdc prospectively, you had the BLACK and RED test lead “backwards”. Try the above steps again and record the new readings. When done disconnect the battery and put away your DMM. On a pinball circuit board you would first verify that all of the proper voltages are available to the board under test. The voltages and their test points are listed in most pinball manuals. Refer to your game's specific manual for voltage levels and their tolerances. 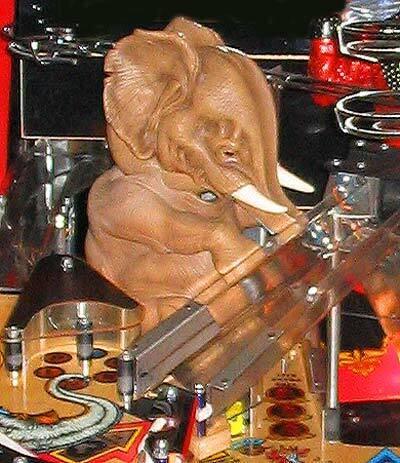 Ground is usually an available test point and is the braiding inside and all over your pinball machine. Note: Use of a pad of paper and a pen are recommended to record the voltages you first verified at the voltage test points. The use of logic probes is often preferred to the use of oscilloscopes because the probes are small hand held piece of test equipment. Many different manufacturers make many different types and styles of logic probes. So, the following instructions will try to be inclusive of many types of probes. For Safety's Sake: Always remember to keep your hands on the plastic, insulated part of your probes and away from the shinny metal point! Also, be sure to contact ONLY the one pin or leg of the component under test with the tip of your logic probe. Another advantage of using a logic probe is that the circuit under test powers it. I recommend that after you verify your +5 Volt DC test point with your DMM; use that test point to power your logic probe. The RED clip lead gets attached to the +5 Volt DC test point. The BLACK clip lead gets attached to the Ground test point or even any of the bare wire braids in a properly grounded pinball machine. I mention this because I know that you would ensure that your pinball machine was properly grounded and that the power supplies were working properly before you did any other troubleshooting. A disadvantage of most logic probes is the fact that they are voltage dependent. As the circuits they are testing power most logic probes, it is even more important to verity that proper operating voltages are available to the boards. With many logic probes, a supply voltage of only +3 Volts DC may give false or ambiguous logic readings. And, with many logic probes, a supply voltage of +7 Volts DC (or greater) may keep the positive LED (usually GREEN ) indicator lit. With almost all logic probes, a supply voltage of +35 Volts DC, or greater, will damage the probe. A damaged probe can apply voltages to the circuit under test; that may damage that circuit. Pictured is the logic probe “Mr. Spock” prefers. You can use a logic probe to quickly tell if the pin on the chip you are testing is at either a: “HIGH” (HI) voltage level, a “LOW” (LO) voltage level, or changing from HI to LO. This changing is called “pulsing”. Most logic probes use LEDs to visually indicate the logic level of the pin on the Integrated Circuit (IC or “chip”) you are testing. In addition to the visual indicators, some logic probes have an audible indicator (“buzzer”) as well. As the audible indicators are not practical for use inside noisy pinball machines and most certainly inside noisy arcades/bars, only use of the LEDs will be covered. In fact, it is recommended that the buzzer be shut of - on probes with buzzers that have the buzzer on/off option. The “LOW LED” (LO) shows Low logic state of a “Binary 0”. TTL chips consider 0 to + 0.8 Vdc to be low. CMOS chips consider 30% or less of the applied voltage to be “LO”. The “HIGH LED” (HI) shows a logic state of a “Binary 1”. TTL chips consider +2.4 to +5 Vdc to be “high”. CMOS chips consider 70% or more of the chip's applied voltage to be “HI”. The “PULSE LED” shows a change of logic level. The change may either be from “HI” to a “LO” or from a “LO” level to “HI” level. One limitation of most logic probes is that TTL voltages of +0.9 – 2.2 Vdc are read as ambiguous or arbitrary voltage levels; therefore none or just the “PULSE LED” may light. The same is true for CMOS percentages between 31 and 69% of the applied chip voltage. In general, the 47XX series of chips are TTL and operate from 2 – 6 Volts. And, the 40XX series of chips are CMOS and operate from 3 – 15 Volts. The explanation of logic states/voltages is shown in summary by the chart below. The next chart is a legend of the different LED's states. The HI LED will be dark. The LO LED will be dark. And the PULSE LED will be dark. The HI LED will be flashing quickly/sporadically. The LO LED will be flashing quickly/sporadically. And the PULSE LED will be flashing quickly/sporadically. The HI LED will remain dark. The LO LED will remain lit. And the PULSE LED may briefly flash at first contact, but then remain dark. The HI LED will remain lit. The LO LED will remain dark. The HI LED will blink at a steady rate. The LO LED will blink at a steady rate. And the PULSE LED will quickly flash at a steady rate. Put the IC and transistor into their sockets on the test circuits. The orientation/polarity mark on the IC goes on the notched end of the chip socket. The flat side of the transistor goes to the outer edge of the circuit board. Now, bring out your logic probe and finally reattach the battery to the test circuit. Ignore the LEDs for the time being. Check for LO and HI logic levels. First attach the meal clip of the BLACK power lead to the tab of the voltage regulator in the circuit under test. Now attach the meal clip of the RED power lead to the VOUT test point. Touch the meal tip of the LP to Pin #8 of the CUT. Record your logic level reading __________ . Leave the BLACK and RED power leads in place. Touch the meal tip of the LP to Pin #1 of the CUT. The PULSE LED may have briefly flashed as you made contact to Pin #8, but the LO LED should have stayed lit. And, you should have recorded a “LOW (LO)” for the first logic reading. The PULSE LED may have briefly flashed as you made contact to Pin #1, but the HI LED should have stayed lit. And, you should have recorded a “HIGH (HI)” for the second logic reading. If you did not get these results, first verify that you have the probe clips attached to the correct power points. Then verify that you probed Pins #8 then Pin #1 on the CUT buy reading pins #8 and #1 of the CUT again. Re-record the correct results. Look at the schematic of the test circuit. Use the LP and the LEDs in the CUT to troubleshoot the test circuit. This is the “clock” portion of the schematic. The clock in the CUT represents the CPU of a pinball machine. You have already checked pins #1 and #8. Some logic probes cannot read the clock pins, but they can read the state of the other pins. This is the control and output portion of the CUT. This portion of the schematic is like the driver board of a pinball machine. Notice that Pin #5 of the clock portion is connected to Pins #5 and #7 of the control/drive portion via the “out” and “in” arrows. Also notice the three other sets of pins that are connected. Record the three connected sets of pins. Pin #____ to Pin #____, Pin #____ to Pin #____, and Pin #____ to Pin #____. You should have noticed that their same common line connects Pins #6 and #9. You should have noticed that Pins #10 and #11 are connected by their same line. You should have also noticed that Pins #12 and #14 are connected by their same line. If you did not notice the connected pin sets, reexamine the control portion of the schematic and record the correct answers. The 4049 in the CUT is a CMOS Inverter IC. The 4049 was chosen because you will be able to use either the TTL or CMOS level selection on your LP. The clock portion toggles HI to LO pulses out from Pin #5 in to Pin #7. Pin #10 drives/lights the LO LED. The LO LED is the indicator that the clock is in its LO half of its cycle. Touch the tip of your LP to either Pin #6 or Pin #9 of the IC. Record the logic level reading on your LP when LED #2 is lit __________ . Touch the tip of your LP back on either Pin #6 or Pin #9 of the IC. Record the logic level reading on your LP when LED #3 is lit __________ . You should have recorded a “LOW (LO or 0)” for the first answer and a “HIGH (HI or 1)” for the second answer. If not, go back and check your work and fix your answers. Which LED on the CUT and LED on your LP glow when LED #4 lights? You should have answered something to the effect that LED #4 does not light. From the circuit description, you know that the 4049 is an inverter. From your previous testing, you know that the clock is HI when LED #3 is lit. And finally, you know that the chip is an inverter. So, the LO clock should give a HI output. Think of it the CUT thusly. So, a HI on pin #15 should turn on the NPN transistor, which in turn, should turn on LED #4. Verify that Pin #15 goes high by using your LP. Record the logic level reading on your LP __________ . If the clock portion of the CUT eventually drives Pin #15 and its associated electronics HI, why doesn't the LED light? Well, you know it isn't the IC. Verify that the Collector of the transistor goes to VOUT by using your DMM. Record the voltage level reading on your DMM __________ . Verify that the Emitter of the transistor is connected to GND using your DMM. You should have recorded about “+5 Vdc” for the first answer and about “+1 Vdc” for the second answer. If not, go back and re-verify the proper voltages. Make the corrections. If the reason that LED #4 does not light is not because of the voltage applied or the operation of the IC, the process of elimination only leaves the following three components: diode, resistor, or transistor. As there is not much to the output portion of the circuit, the chance of an open connection is slim. If you were repairing an actual pinball machine, it would be best to first verify all connections/traces on the circuit board, then you could “shotgun” all three suspect components. As the transistor is socketed, ask the instructor for a replacement. Then, verify that you have been given the correct transistor. Next, install the new transistor in the same orientation as the old component. Finally, observe the color of LED #4. Record the color of LED #4 __________ . You should have observe and recorded that the color of LED #4 is blue. This ends the text and lab portions of the Logic Probe Seminar. Next is the written test. Proceed to the end of seminar and take the written test. AC An acronym for, Alternating Current. Boolean Algebra A branch of algebra in which elements have a value of zero (0) or one (1). And, the algebraic operations use of AND / OR are added and multiplied. CMOS An acronym for, Complementary Metal Oxide Semiconductor. Current Measured in Amperes, current is the flow of electricity in an electronic circuit. (Think of electrical current as the flow of water in a river. The wider the river, the greater the amount of flow.) Safety rule - amps kill! CUT An acronym for, “Circuit Under Test”. Whereas DUT is an acronym for, “Device Under Test”. DC An acronym for, Direct Current. Digital Logic A yes/no system where the voltage level below a certain expected point is considered "no" and given a value of zero (0). And, where the voltage above a certain expected point is considered "yes" and given a value of one (1). DMM An acronym for, “Digital Multi-Meter”. This is a piece of hand held test equipment that allows the testing and troubleshooting of electronic components and circuit boards. Oscillation A cycle from it high point through its low point. Oscilloscope An electronic test instrument that uses a monotone monitor like display to show “trace” representing oscillations of voltage and current. TP An acronym for, Test Point. Troubleshoot To determine the cause of a problem. TTL An acronym for, Transistor – Transistor Logic. Voltage Measured in volts, voltage is the electrical pressure inside an electronic circuit. (Think of voltage as the swiftness of the water in a river. The faster the current, the greater the amount of force.) Safety rule - volts hurt! 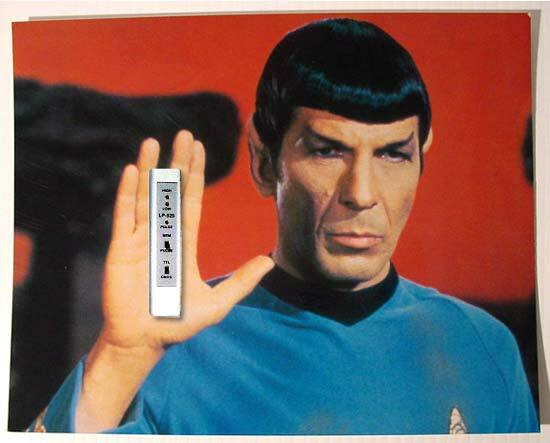 You can either get a kit (LP-525K LOGIC PROBE KIT) or probe (LP-550 LOGIC PROBE) from the above on line seller. If you are somewhat handy with electronics and soldering, I recommend the kit. If you don't feel comfortable, I recommend the probe. The following on-line reference covers general use of logic probes as well as specific information relating to the use of logic probes to troubleshoot individual pinball boards. This following twelve-question test is PASS or FAIL. You must get ten or more correct answers (83%) to PASS. Read each question carefully. Some questions require a written answer, while others are fill-in the blank, some are true/false, and others have multiple choices. This is an open book test. Complete the following twelve questions. Q1) From the list below select the two most important things to remember when working with any electrical circuit. Q2) From the following list, select what should be verified before your begin any work or any troubleshooting on any pinball machine. Q3) Select what should be verified before your begin any troubleshooting on any pinball machine. Q4) Choose what must be verified before your can begin correctly troubleshooting any circuit board on any pinball machine. Q5) Which is the best voltage to run your logic probe off of / attach your logic probe to? Q6) Choose the maximum voltage level for a logical zero (0) on a TTL chip. Q7) Choose the minimum voltage level for a logical one (1) on a TTL chip. Q8) Circle the correct True or False answer. Q9) Circle the correct True or False answer. Q10) Circle the correct True or False answer. Q11) Fill in the blanks. A) __________ hurt. B) __________ kill. Q12) What single thing is the first and most important aspect of dealing with electricity? A1) Only the two following are acceptable. A2) Only the following single answer is acceptable. A4) Only the following answer is acceptable. A5) Only the following is correct. A6) Only the following is correct. A7) Only the following is correct. A8) Only the following is correct. A9) Only the following is correct. A10) Only the following is correct. A) Volts hurt. B) Amps kill. A12) Only the following is acceptable. This ends the Logic Probe Seminar at the April 1st Pinball Circus.